Mumbai: Over the decade to 2016, the rate of crime against dalits rose more than eight times (746%); there were 2.4 crimes per 100,000 dalits in 2006, rising to 20.3 in 2016, according to an IndiaSpend analysis of 2016 National Crime Records Bureau (NCRB) data, the latest available. Mathura: Protesters disrupt railway services at Mathura railway station to protest against the dilution of the SC/ST Prevention of Atrocities Act, on April 2, 2018. The rate of crime against adivasis or scheduled tribes grew by over 12 times (1,160%)–from 0.5 in 2006 to 6.3 in 2016. However, cases pending police investigation for both marginalised groups has risen by 99% and 55% respectively, while the pendency in courts has risen by 50% and 28%, respectively. The conviction rates for crime against SCs and STs have fallen by 2 percentage points and 7 percentage points, respectively, to 26% and 21%, from 2006 to 2016. On March 20, 2018, the Supreme Court expressing concern over the misuse of the Scheduled Castes and Tribes (Prevention of Atrocities) Act, 1989, ruled there shall be no immediate arrest of a citizen or public servant without prior permissions for crimes registered under the Act. It also introduced the provision of anticipatory bail if the complaint was found to be malafide. 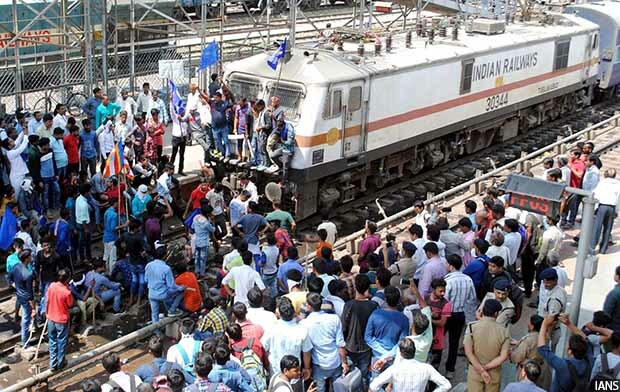 This triggered widespread protests by dalit and adivasi organisations across the country and the Bharat Bandh protests held on Monday, April 2, 2018, turned violent in Rajasthan, Uttar Pradesh, Bihar, Gujarat, Odisha, Punjab, and Madhya Pradesh, resulting in the death of 11 persons. During an urgent hearing of the Centre’s review petition on Tuesday, April 3, 2018, the SC refused to stay its order, asserting that it is only meant to protect the rights of innocent people without affecting those of the marginalised communities. Dalits, or schedule castes, comprise 16.6% (201 million) of India’s population, up from 16.2% in 2001, according to Census 2011. Adivasis form 8.6% (104 million) of the country’s population, up from 8.2% over a decade. As many as 422,799 crimes against dalits or scheduled castes (SCs) have been reported between 2006 and 2016. The highest increases in crimes were recorded in eight states–Goa, Kerala, Delhi, Gujarat, Bihar, Maharashtra, Jharkhand and Sikkim–where rates rose over 10 times. Meanwhile 81,322 crimes against adivasis have been reported from 2006 to 2016, with the highest increases in crime rates recorded in Kerala, Karnataka and Bihar. While the reporting of crime against dalits and adivasis has risen over the decade, there has not been an equivalent rise in the rate of disposal of cases by the police and courts, as we said. PENDING POLICE INVESTIGATION: Cases of crimes against SCs pending police investigation have nearly doubled (99%)–from 8,380 cases in 2006 to 16,654 cases in 2016. And Bihar, with 4,311 cases, fares worst among the 36 states and union territories (UTs). FALSE CASES: The number of crimes against dalits registered and found to be false at the investigation stage by police has remained the same (less than 6,000 cases) and has actually declined in the comparison to the rise in reporting. Of 5,347 cases found to be false across India, nearly half or 49% of false cases were recorded in Rajasthan alone (2,632 cases). Crimes against STs registered and found to be false have further declined by over 27% from 1257 cases in 2006 to 912 cases in 2016. PENDING TRIAL IN COURT: In courts, crimes against dalits pending trial have risen by 50% over the decade–from 85,264 to 129,831 as of 2016. In 2016 alone, 40,801 new crimes against dalits were registered under the Prevention of Atrocities Act; less than 15,000 cases completed trial that year. The number of trials completed in court has dropped by 28%–from 20,495 in 2006 to 14,615 in 2016. UP with 33,455 such cases pending fared worst. For adivasis, trials completed in a year has nearly halved (by 49%) since 2006–from 2,895 to 4,317 in 2016–while those pending trial has risen by 28%. Madhya Pradesh, with 4,839 pending trial cases, held the worst record. Note: 2014 and 2015 data for pending trial not available. Among the crimes that do get disposed of in court, about a quarter lead to convictions in crimes against dalits. As of 2016, this conviction rate–calculated by dividing the number of convictions in a year by number of cases completing trial in a year–stood at 26%, a 2 percentage point decline from the rate a decade ago (28%). Accused persons in the rest 74% of cases completing trial in 2016 were acquitted, which again is a rise from 2006 when 72% of cases led to acquittals. As of 2016, Madhya Pradesh (43.4), Goa (43.2), and Rajasthan (42), held the highest crime rates against dalits. Their conviction rates were 31%, 8% and 45% respectively. Conviction rates in Sikkim, Karnataka, Andhra Pradesh, Himachal Pradesh, Orissa, Gujarat, Telangana, Goa, Tamil Nadu and Kerala are particularly low–less than 10%. Delhi reported the highest rise (67%) in acquittals over the decade. The conviction rate in cases of crime against adivasis, at 21% in 2016, is even worse, showing a 7-percentage-point decline from 2006 (28%) with the rest 79% acquitted. Kerala reported the highest crime rate (37.5) against STs, followed by the Andaman & Nicobar Islands (21) and Andhra Pradesh (15.4). Their conviction rates were 8.2%, 0%, and 1.1% respectively. A ‘zero’ conviction rate was reported in 2016, by the Andamans & Nicobar Islands and six states–Gujarat, Karnataka, Tripura, Uttaranchal Pradesh, West Bengal, and Delhi. Late registration of complaints, delays in spot investigation, lack of protection for the victims and reluctance to register crimes under the relevant sections of the Prevention of Atrocities Act–these are some of the chief reasons for low conviction rates, according this 2017 study of reports by civil society organisations and parliamentary committees by the Centre for Study of Society and Secularism, an NGO based in Mumbai.